Do we need nuke energy in a sun-blessed India? Solar settlement Frieburg, Germany. This town enjoys complete freedom from man-made energy. Individual homes, offices, and industrial units generate solar power on their own. Looks like, at last, the West is waking up to impending nuclear disasters. Once reactors exploded one after another in the post-tsunami Japan, huge crowds came out with placards in Germany and told the government to “shut down” all the nuclear facilities at once. Perhaps, it takes a tsunami to realise that nature can spike human efficiency at its absolute best with just a whim. A life without nuclear energy may sound near-impossible right now. Yet, Germans can take heart, or indeed, be proud of the shining example they have set in their own backyard: Freiburg. This is where people have achieved freedom from human-made power to bask in the warmth of the sun. 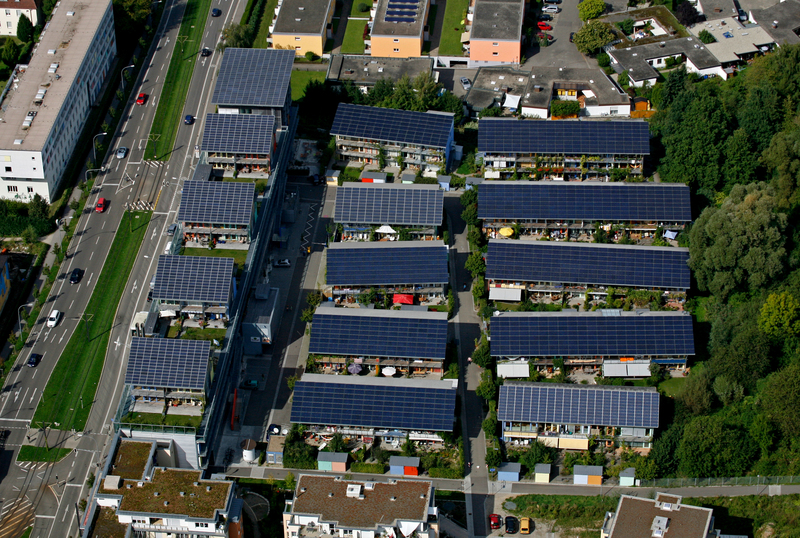 Individual homes, offices, and industrial units generate solar power on their own. With inbuilt natural geothermal-based cooling systems, Freiburg hosts some of the most aesthetically fabulous, sunlit buildings. They are completely independent and off the grid. What more, the town is clean and breathes healthy air. Back home, the issue has cropped up once again in Kudankulam plant in Tamil Nadu. A few months ago, the government faced opposition against the 9,900-MW Jaitapur Nuclear Power Project from the Madban villagers of Ratnagiri district in Maharashtra. Perching on a seismic zone, this area has reportedly suffered 92 quakes in 20 years. As to how such a quake-prone area was chosen for a project of this nature is not surprising. We know such things happen here in India. However, the shudders that the Madban residents are experiencing now are quite different from the ones they did in the past. This anxiety, restlessness is rooted in the seemingly futile efforts being made in Fukushima to thwart multiple disasters. Perhaps, for all good reasons, both Kudankulam and Madban residents are already distancing themselves from the collective consciousness that takes pride in the country’s new-found nuke status. I am sure they didn’t give a hoot for the then Environment Minister Jairam Ramesh’s assurance of “putting additional safeguards in Jaitapur and other sites across the country”. That’s because, first, this statement is a bunch of hooey and needs no explanation why; second, the ministry did not have a say over the nuclear safety issues of power plants. And now, we have former President Abdul Kalam expressing his “complete satisfaction” with the “sophisticated safety featurs of the reactors at Kundankulam”. Look, how stark the difference is between saying ‘no’ to nuke power and a Prime Minister of a developing country emerging out of the House (mid-2008) with both thumbs up following a harrowing discussion on getting the US assistance for nuclear energy? The problem is not with nuke technology alone. It is more to do with misinterpreting this as development. That’s where the rub lies. And this will continue because the Indian government has made it clear that it will go ahead with the new projects. For once, why can’t we shut our eyes for a minute and dream a solar future? Is that too much to ask for in a sun-blessed country like ours? This entry was posted in Endlessly Green, Free Flowing and tagged Frieburg, Germany, Jairam Ramesh, Jaitapur, Jaitapur Nuclear Power Project, Japan, Koodankulam, Nuclear power, solar energy. Bookmark the permalink.